Thirteen students, led by Delhi University Students’ Union President, Satendar Awana, were on a hunger strike to protest against the sudden announcement of cutdown of seats at Delhi University’s Law Faculty by nearly 800 following the recommendations made by the Bar Council of India. This move has come after a postponement of the admissions process where students were led to believe that counseling would start soon, only to be hit by news of reduction of intakes. 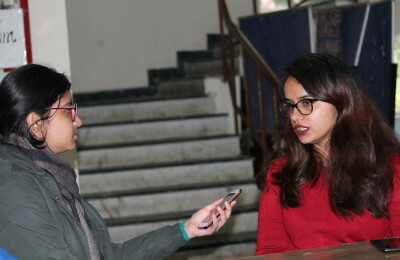 In recent developments, the students were talked into calling off their strike and were assured by the Dean of the Faculty of Law that a letter had been sent to the BCI, only to find out that no such communication had taken place. The Law Faculty, Delhi University, has faced a lot of flak from the BCI, the authority that controls Legal Education in India, in recent years for the lack of proper infrastructure in its three centres and for flouting several of its guidelines. In 2014, in an unprecedented move, the BCI had derecognised DU’s LLB programme after the University had failed to seek fresh affiliation for its centres. According to news reports, it would have had an impact on all Law Faculty graduates post 2011 because that’s when the institution flouted BCI guidelines by increasing the number of seats without the basic infrastructure for it. Provisional affiliation was granted for the session of 2014-15. The Law Faculty currently does not have an affiliation with the BCI. After the declaration of results of the LLB entrance exam this year in July, the University had issued a circular about the delay in the admissions process and the postponement of the session due to “unavoidable circumstances”, which were that the Faculty was still awaiting BCI’s approval before starting the admissions process for the new session. The BCI recommendations arrived in the early days of August and the Law Faculty wasn’t in the clear despite plans to shift to a new, better-built campus. The BCI report approves intake of just 1440 students as opposed to the Law Faculty’s intake of nearly 2200 students in previous years. This scrapping of almost 800 students understandably did not go down well with law aspirants who were confident of making it to the prestigious institution based on its previous intake numbers. The move has left them reeling because admissions were invited at 2200 seats and the decisions to reduce their number came weeks after the declaration of the entrance results and the original date on which counseling was supposed to start. On August 14, 2016, one day into the hunger strike, we spoke to some of the students who were on a hunger strike to give us their account of the situation. Seated on mattresses with table-top fans in the corridor, several accounts of the effect of the last minute cut-down of seats emerged. Binny Chopra, a law aspirant and one of the thirteen students on the hunger strike, resigned from his job at an accounts firm after the declaration of the results of the entrance exam. He also told us about several friends who didn’t pursue admissions in other law colleges despite clearing their entrances because they were counting on the Law Faculty and had made the cut according to the original number of seats offered. They are left with nowhere to go to with the other universities having closed admissions now. There is a consensus amongst the protesting students about the unfairness of the situation where the original number of seats announced in the prospectus and before the entrance exam was 2200 and this number was cut down without any prior information after months of delay in the admissions. Awana informed us that the authorities, including the Dean of the Faculty of Law, were assuring the students of admissions at the original number of seats days before the notification of the cut-down dropped. The students are disappointed by the lack of resolve shown by the authorities. According to our sources, on the eve of Independence Day, the protesters were visited by the Maurice Nagar SHO and the Proctor of Delhi University. They told the students that their demands were being worked on and would be taken care of in the next few days. They also requested them to adjourn their strike, to which the students agreed, hopeful about the concern being shown by the authorities. Awana later received a call from the Dean of the Faculty of Law assuring him that the authorities had written a letter to the BCI, asking them for a stay on this case which would allow them to admit students according to the original number of seats. When the student protestors asked to be shown the letter, it turned out to be something that the authorities had written to the BCI in the past. No fresh communication had taken place from the Dean to the BCI post the recent recommendations by the body. The final decision in this limbo being played by the BCI and the Law Faculty is being awaited by the students in the hope that they weren’t unfairly denied a chance to study at the institution of their choice because of carelessness of the authorities. In a phone conversation with DU Beat, the Dean of the Faculty of Law, SC Raina, denied claims that the aspirants had been tricked and showed an old letter. He said, “There were two documents. One was a letter dated July 23. The other, which was shown to Awana, was an application that was dated August 16.” When the student protesters were informed about this, they denied being shown the letter written on August 16 and said that it’s possible that it was written by the authorities under pressure after interacting with them. Previous PostA Raksha Bandhan – From a sibling with (only) a sister’s point of view Next PostInsights and ideas: What to do when it rains?